Jean Grémillon worked alongside the very best – Jean Renoir, Marcel Carne and Jacques Feyder to name a few. Lumière d’Été additionally, released only four years after La Règle de Jeu (Renoir’s highly acclaimed masterpiece that has remained in the Sight & Sound’s Top 10 Greatest Films of All-Time since 1952), means it is suprising that Jean Grémillon fails to even make the index pages of Mark Cousins definitive The Story of Film. We wonder whether Jean Grémillon is an integral part of cinema-history – He absolutely is; vastly underrated and clearly a filmmaker who shrewdly created art pieces that remain much more than mere entertainment, Jean Grémillon deserves a re-appreciation – and it is only through the BFI that this was made possible. 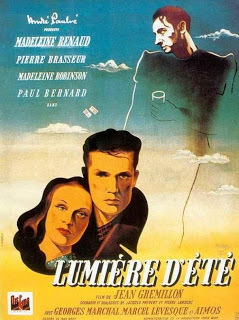 Lumière d’Été is an exploration of society and class through the eyes of a small number of characters – a topic that censored Renoir’s La Règle de Jeu and earnt the ire of the Nazi’s censors. Akin to La Règle de Jeu, it remained unseen for many years as the film depicted blood-thirsty and dangerous aristocats alongside proud working-class labourers – something that seemed a little bit too close to the truth. Central to the film is Michèle (Madeline Robinson), arriving at The Guardian Angel hotel, she awaits her husband, Roland (Pierre Brasseur). While waiting, she meetings Patrice (Paul Bernard), owner of the hotel, and Cricri (Madeline Renaud), hotel manager. Patrice falls for Michèle; Cricri loves Patrice; the waiter – similar to Manuel of Fawlty Towers – provides comedic moments. But this is a tragic story whereby the return of Roland in his drunken, argumentative state gives Patrice the impression Michèle could fall for him (the arrogance of aristocrats) – and the jealousy of Cricri changes her attitudes towards everyone. Crucially, Michèle falls for humble stone-worker Julien (Georges Marachal) – something Roland and Patrice, when they find out, find truly unbelievable. With a similar, sleazy manner to Pete Campbell in Mad Men, Patrice is a truly detestable man – slowly changing from a conflicted romantic and into an offensive, cruel and – eventually – homicidal character (something Mad Men hasn’t touched upon). 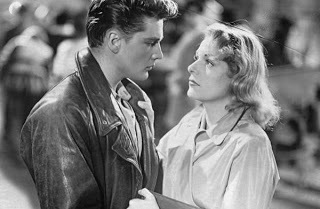 Considering the differences and the roles in society these people represent, alongside the tragedy form of the story, it is clear that Grémillon owes much of this story to Renoir and La Règle de Jeu but the structure of Lumière d’Été is far more playful – opposed to the contained context of Renoir’s masterpiece. Lumière d’Été breaks the film down into four acts. Starting in The Guardian Angel, the story moves to Patrice’s Castle and the extravagant party he holds, until the final act on the rocky cliffs and cable-cars within the French hills. This change of scene does offer an alternative outlook and progression that could represent a world whereby it is initially within a borrowed society, through to a controlled and false-celebratory system until a final act that reduces the characters actions and emotions to animalistic within the natural landscape. In that regard, the symbolic and representational themes within La Règle de Jeu becomes the foundations that Grémillon has built upon to great effect. Throughout the film, a recurring moment appears on screen – the shot of rocks, rolling and crumbling towards us. The inevitable falling stones from a built civilisation? The decline and madness from a corrupt empire? The party held by Patrice in his home is fancy dress and Roland – ever dramatic – is Hamlet. The parrallels are clear enough – the nationalism; the shocking depicition of an elite monarchy; the decline and madness from a corrupt family. Even the working-man, with silhouetted figures and nameless workers within mines hints to the industrialism depicted in Lowry’s paintings of the same time period. These rocks are used sparingly – and our final view of them truly forces Grémillon’s point home. Grémillon has created a multi-layered, deeply poetic film that is, on the one hand as intelligently intertwined as Renoir’s La Règle de Jeu but on the other hand could be considered convoluted and unclear in its social commentary. Ginette Vincendeau has introduced many films during the season and celebrates his work by noting his “lyrical camerawork” and “poetic realism” in its attitude toward modernity. Though many modern film historians may not celebrate Grémillon, it is worth noting how high Jean Luc Godard regarded him – and, as Grémillon was a musician and playfulled juxtaposed crumbling stones against horrific moments, it would be worth considering Godard and Vincendeau’s opinion and seeking Grémillon out for yourself. This is a man who told more than stories; he was telling us what he believed. Next Tooting Arts Club Presents … Lido Cinema! I have just come across your site screeninsight.blogspot.com and would be really interested in chatting to you further about some advertising opportunities and partnerships that would be mutually beneficial for us.